The MindWinder Orchestra is an 18-piece big band created by visionary musician Dale Head. It features a full rhythm section (drums, bass, guitar, piano and organ) as well as a 13- piece horn section. The full show also includes impressive light and video effects that are choreographed to the performance. A culmination of Dale’s 20-year vision for a big band that would capture the power of a rock show with the force of big band orchestration, the sound is most aptly described as Pink Floyd meets Postmodern Jukebox. Currently, the MindWinder Orchestra is performing songs from Dale Head’s latest national release, “Swing on the Rocks,” as well as tunes from his first national release, “Swing Straight Up,” and classics from the Great American Songbook such as Joe Williams, Frank Sinatra, Sammy Davis, Jr. and Michael Bublé. Dale Head has melded the power of a big band with popular classic rock tunes to transport audiophiles, jazz fans and rock lovers to new musical heights. The MindWinder Orchestra travels with the full rhythm section, and smaller versions of the MindWinder Orchestra are available for smaller venues. Dale Head is a visionary artist who has combined rock music and an 18-piece big band to create a sound most aptly described as Pink Floyd meets Postmodern Jukebox. Dale Head and his brainchild, The MindWinder Orchestra, will take you on a musical journey through 50 years of music from the Great American Songbook to rock classics. His live shows feature lighting and video effects that create a unique live music experience. 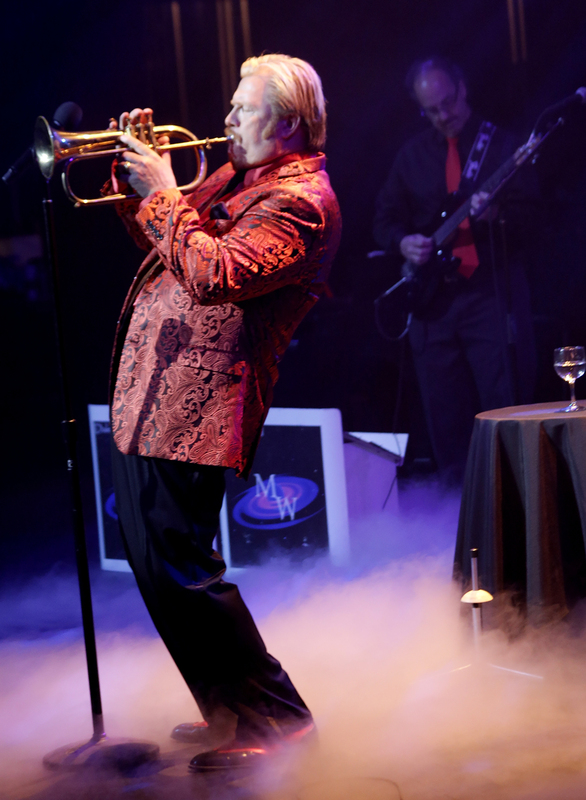 Dale’s second national album, “Swing on the Rocks” – featuring the B3 stylings of Paul Shaffer, the trumpet playing of Grammy winner Steffen Kuehn, and the phenomenal musical arrangements of Rick Walsh – brings together the rock and big band genres like no other. Currently playing on over 80 stations nationwide, “Swing on the Rocks” is the culmination of a 20-year vision to combine Dale’s love of both big bands and the Great American Songbook (as showcased in his first national release, “Swing Straight Up”), and the rock influences that were so prevalent in his childhood, adolescence and early adult years. When he was just 5 years old, Dale was singing along with Motown and soul artists such as Aretha Franklin, The Jackson 5 and Diana Ross. He also started playing the trumpet at age 11. The moment when Dale understood the power and passion of music was when he found Maynard Ferguson at age 15, who was one of the first artists to use the power of a big band to explore different musical genres. Through all of these influences, Dale has forged a musical style that is all his own. On his first CD, “MindWinder” (1995), Dale delivered new and exciting arrangements, which bring to mind the innovative horns of Blood Sweat and Tears, the vocal intensity of Melissa Etheridge and the guitar gymnastics of Van Halen. Dale returned to the studio in 2014 to record his 2015 release, “Swing, Straight Up,” a full-length big band album that captures several favorites from the Great American Songbook and some new songs arranged in a classic style. Dale Head released his latest album, “Swing on the Rocks,” in July 2018. That album features an epic collection of songs, spanning the genre from “13 Women” (the A-side of Bill Haley’s 1954 hit “Rock Around The Clock”) to the 1997 Grammy-winning song “Criminal” by Fiona Apple, and includes unique takes on well-known rock classics from artists such as Van Halen, Rush, Van Morrison, and the Eagles. Enlisting phenomenal arranger Rick Walsh (who worked with iconic artists like Linda Ronstadt and Metallica in its legendary San Francisco Symphony performance, and the live Broadway production of The Producers), Dale uses his powerful and dynamic vocals to reinvigorate these rock classics. On “Swing on the Rocks,” Dale is surrounded by an 18-piece big band style orchestra that features amazing guitar solos and the impressive stylings of Paul Shaffer (of the CBS Orchestra on Late Night with Dave Letterman) on the Hammond B3 organ throughout, creating a riveting roller coaster of a musical ride.